Learn how to use "scare cards" to you advantage, especially when playing online at the micro stakes. Nathan @BlackRainPoker Williams shows how to use scare cards to your advantage at the lower limits. Something I have noticed from playing and coaching at the micro stakes for many years is that a lot of people do not make effective use of scare cards. This is a huge problem, because this is one of easiest ways to start improving your profits at the poker table. Top winning poker players don't magically get dealt more good hands than everybody else. No, what separates them is that they take away more pots when nobody really has anything very good. This describes the majority of situations in poker, by the way. Using scare cards to your advantage at the lower limits in particular is one of the easiest ways to start winning more pots like this without going to showdown. In this hand we raise with a suited one-gapper from the cutoff in a five-handed poker cash game. This is a perfectly fine hand with which to try and steal the blinds for me personally. It is a slightly loose open, though, so if you are brand new to poker or not that confident in your postflop abilities yet, then it is fine to fold this hand preflop as well. 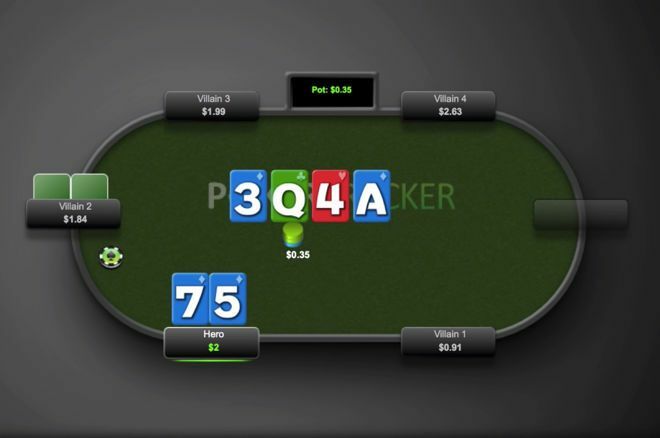 Nevertheless, as played we connect well with the flop by hitting a gutshot straight draw to the nuts and a backdoor flush draw. It is also a rather dry-looking, harmless queen-high flop so this should be a standard continuation bet. On the turn is where the real problem occurs in this hand. We catch an absolutely perfect card to continue barreling on. The is truly the ideal "scare card" here. Not only does this card give us plenty of additional equity with the added flush draw, but the ace is a very scary card for so many middle-pair hands. Heck, even a hand has to be a little bit apprehensive about calling again here considering how much aggression we have shown throughout the hand so far. So it is a serious mistake not to continue betting again on the turn. If you want to start improving your results at the lower limits in particular, then it is very important that you become aware of spots like this and continue betting. You just can't sit around waiting for the nuts all day before getting aggressive in poker and expect to turn a profit over the long run. You just won't get dealt enough good hands. You need to make sure you are using scare cards like this to your advantage. And when you pick up additional equity like we did in this hand, then it really just becomes a slam dunk to keep applying the pressure. Let me know your thoughts on this poker hand in the comments below. How would you have played it?